"Trial and error pay off! Time-consuming, but so worth it." Put 3 mint leaves and 2 teaspoons sugar into each of 2 glass tumblers; vigorously stir sugar and mint together, crushing mint with the back of a spoon to release oils. Add 3 lime wedges to each glass; again stir vigorously to release some lime juice. Pour 1 jigger rum into each glass. Fill glasses with ice cubes and top with carbonated water; stir. 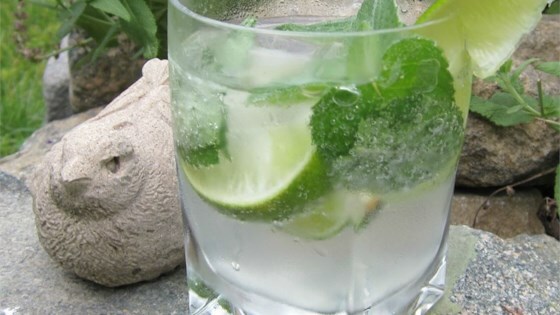 Make a delicious, refreshing mojito from scratch. Enjoy! I've recently discovered I like mojitos, and this is no exception. I used bottled lime juice and regular white rum, per what I had on hand. I also prefer Diet 7up to club soda. CHEERS, Alycia! Was very good, I used strawberry rum and a little less sugar. Yummy! Followed the recipe but I didn't have club soda so I used tonic water and squeezed half a lime in each glass with lots of crushed fresh lime from my garden. So so good! We use dark rum and fresh mint from the garden. Good and strong. Also find that making each glass to order is thee only way. Using a shaker or to attempt a pitcherful...NO! This was really good, and I don't generally like alcohol! Couldn't find lemon rum so I made it with lemon liqueur and I enjoyed it. I made this about 5 times amount in a large jug for friends. Was a big hit. Also hits you hard after a few of them.